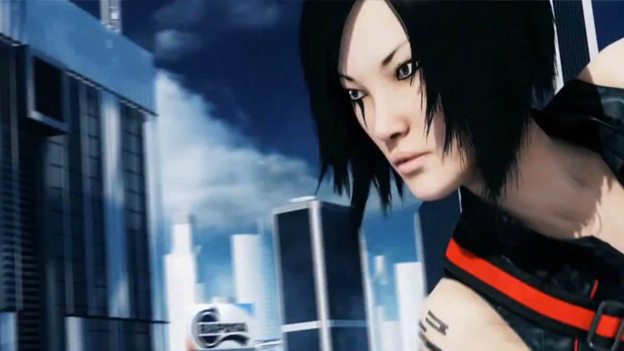 At the EA press conference at E3 this year, we were given our first look at the brand new Mirror’s Edge. Note that this game is still very much in the conceptual stages. 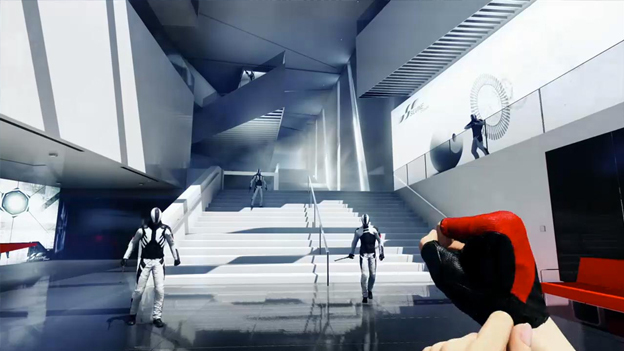 There was a prototype shown, but final details about the stages, the way Faith (the protagonist) moves, and even the story are still up for being changes. It was a very, very, very early look at a very early in development game, so take all of these impressions with a grain of salt because they very well may be changed before the game actually comes out. EA is doing a lot of work on figuring out how Faith should move in his new free running first person game. They are motion capturing a lot of parkour professionals and in the process rethinking what Faith is able to do. In the trailer, they showed Faith wall running, climbing up edges, wall jumping, wall scrambling to get a little higher, vaulting off pipes, climbing up pipes and fences, zip lining, doing tumbling rolls on landing, sliding down inclines, baseball sliding under obstacles and more. They are working very hard to integrate your movement and combat. Instead of running up to an enemy and punching and kicking them, Faith can now use the environment to her advantage. If she vaults over an edge at an enemy she can land on, him knocking him out. She can baseball slide through an enemy’s legs to trip him up. She can run and flying kick an enemy, or knee an enemy in the gut, without breaking her stride. She can even roundhouse kick enemies off of walls. Stealth will also come into play in this game. If you stick to high rooftops where enemies cannot see you, you can progress in the game unhindered, or even get the drop on your enemies before they even get a chance to attack. Difficulty is another thing that EA is taking a deep look at. Instead of simply including difficulty levels that change how hard the game is, the game will change its difficulty based on how you play it. It seems as if the developers are putting focus into how you would speed run the game. The fastest route through any given level will be the most obviously difficult one, asking you to make split second jumps and putting you in the path of many dangerous enemies. If you aren’t as good at the game as that, then you can easily take a much slower route. You can slowly time your jumps from rooftop to rooftop to completely avoid complex mazes and threatening enemies, but you also won’t be experiencing the rush of parkour, nor will you be getting a very high rating on any stage. The game will once again have a very minimalistic color scheme. You’ll rarely see anything beyond whites, blacks, highlighted reds for objects you can interact with, and the blues of the sky. Once again, you can follow the path laid out in red to get to your destination, or you can go off the beaten path and find your own way. The choice is up to you. The entire game will be open world and will have a lot of verticality, allowing you to even participate in some base jumping style segments. Unfortunately there wasn’t much more to see at the show than that. 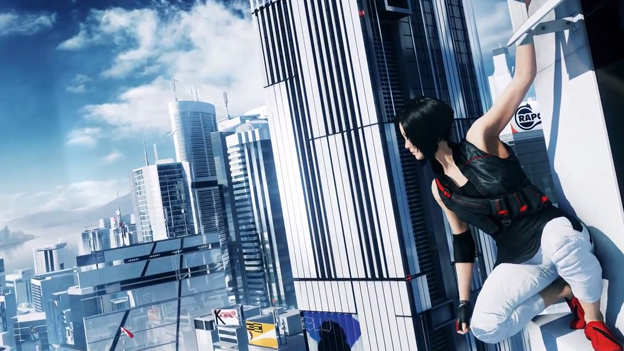 Much of the Mirror’s Edge presentation was filled with buzzwords and talks about development. EA said that they are making a faith for a “new generation.” Whether this is just another way of saying that it’s an open world game, or it’s alluding to a much bigger change, is uncertain. 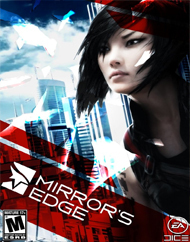 Mirror’s Edge will be releasing for the Xbox One, PlayStation 4, and PC.